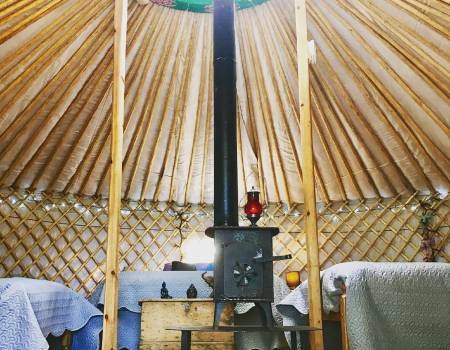 Why not book one of our Mongolian yurts and tuck up in a proper bed at night and enjoy the warmth of an outdoor fire pit or rustic wood burning stove. This is camping in style! Our traditional Mongolion yurts are comfortable, clean and cosy. Each yurt is slightly different but they all sleep up to 6 persons comfortably. They have proper beds which are made up for your arrival. 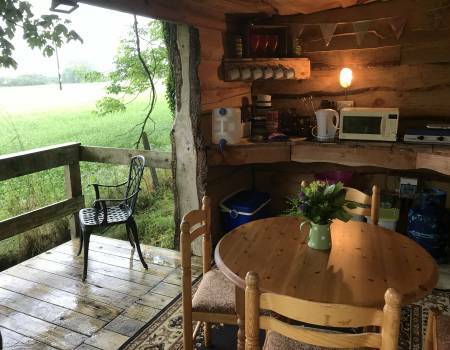 There unique selling point is most certainly the exclusive cabin kitchen, fully equipped with everything you need including fridge freezer, gas hob, toaster and microwave. For 2019, we have also added a washing up sink with hot and cold running water. Externally there is an individual garden area with fire pit, low seating for campfire evenings, picnic bench and hammock for relaxing under the stars (our stars are stunning on a clear night). There is a wood burning stove which takes just 20 minutes to heat up the yurt. There is mains electricity for power and lighting in the yurt and cabin kitchen. Perfect for after dark and charging phones or laptops. Free Wi-fi is also available. The yurts are well positioned for privacy and each has their own parking spaces directly outside. Hot showers and flushing toilets are located in the communal block, just a short walk in the opposite corner of field. 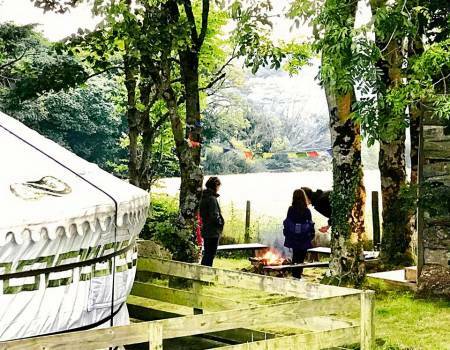 The yurts are available for a minimum 3 night stay, from Easter to November with a 15% discount when staying for 6 nights or more. Recommended for: families, couples and small groups of friends (maximum 4 adults).